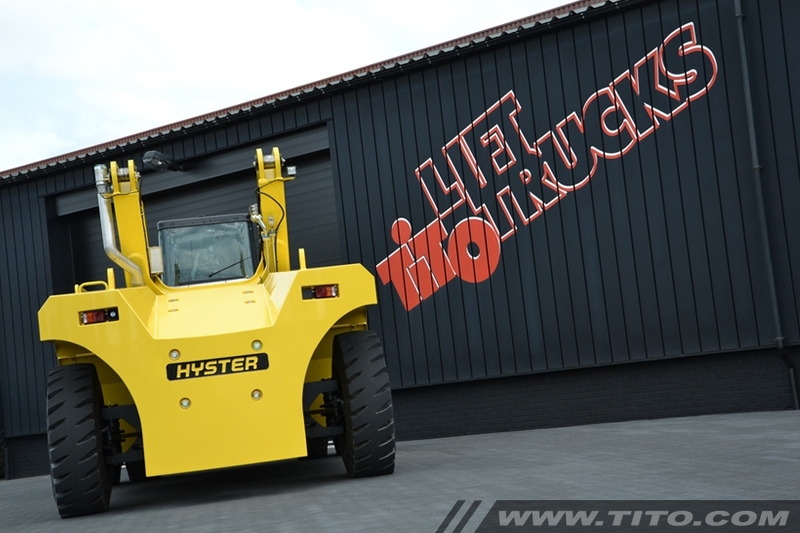 When it comes to reach stackers, the most cost-effective choice is a Hyster Reach Stacker. It is known for its competitive price and low costs for running and service. The same can be said about spare parts: they are readily available, delivered fast and affordably priced. 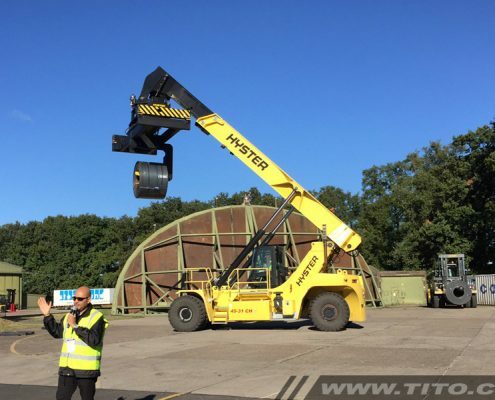 Reason enough to choose a Hyster reach stacker. 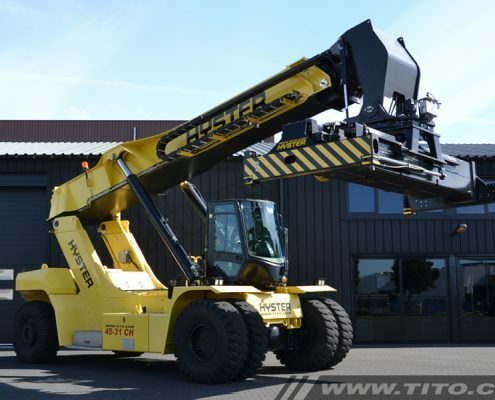 Click here for our stock of new and used reach stackers. 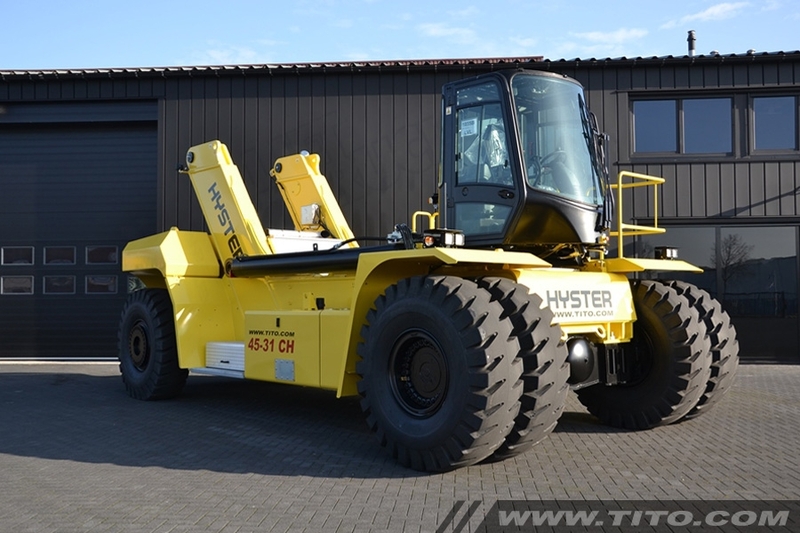 Click here if you wish to order your Hyster spare parts online. 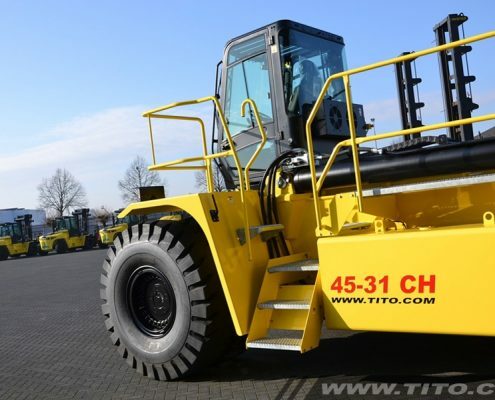 Tito is not just the address for reach stackers, but also for laden container handlers and empty container handlers. For smaller lifting needs you can take a look at our forklifts. 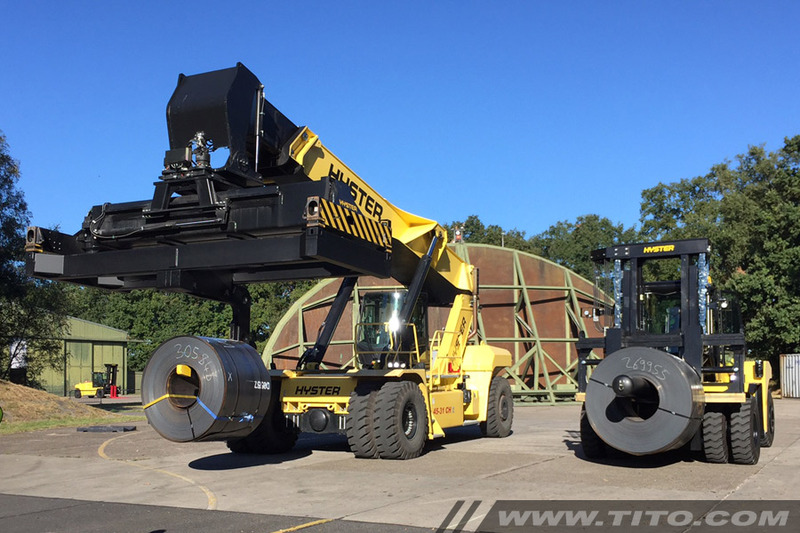 A Hyster reach stacker is the most flexible solution when it comes to getting the most from available space in container terminals. 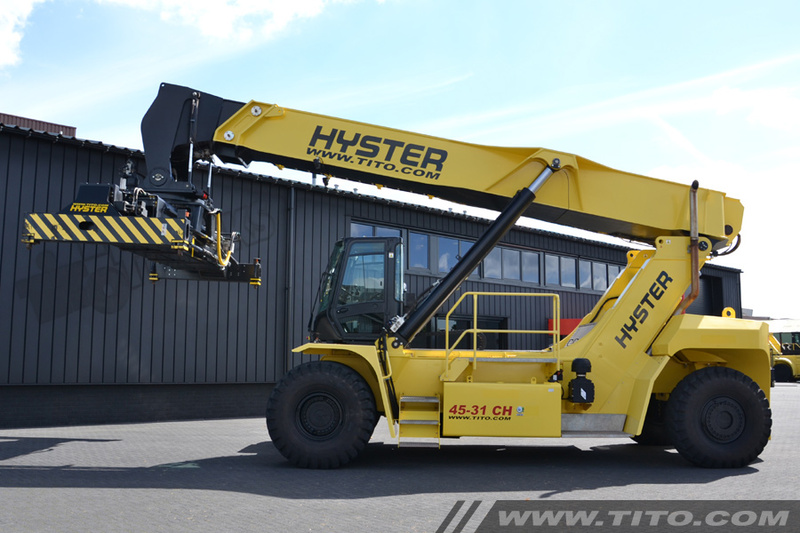 The RS45/46 series reach stackers consists of both container handlersand intermodal handlers, capable of handling standard 20’, 30’, 40’and 45’ ISO containers. The intermodal handlers are also capable of handling swap bodies and semi-trailers. If you have any questions about how to choose the right reach stacker for your application, don’t hesitate to contact us. 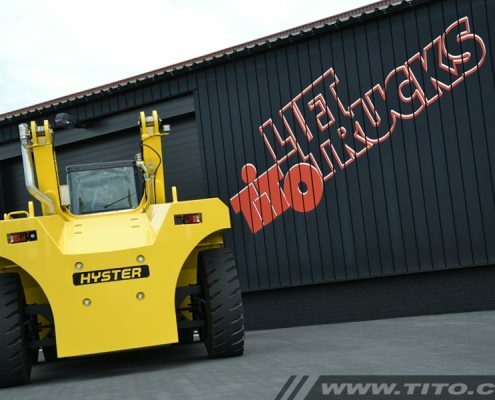 Tito has a large selection of new and used equipment, so we are sure we have the right solution for you. For your convenience, the following tables list the model numbers for North and South America (‘US’) and the rest of the world (‘European’). A ‘-‘ indicates no equivalent model number exists. Optional: 272 kW (365 Hp) power package as opposed to the standard 224 kW/300 Hp power package. 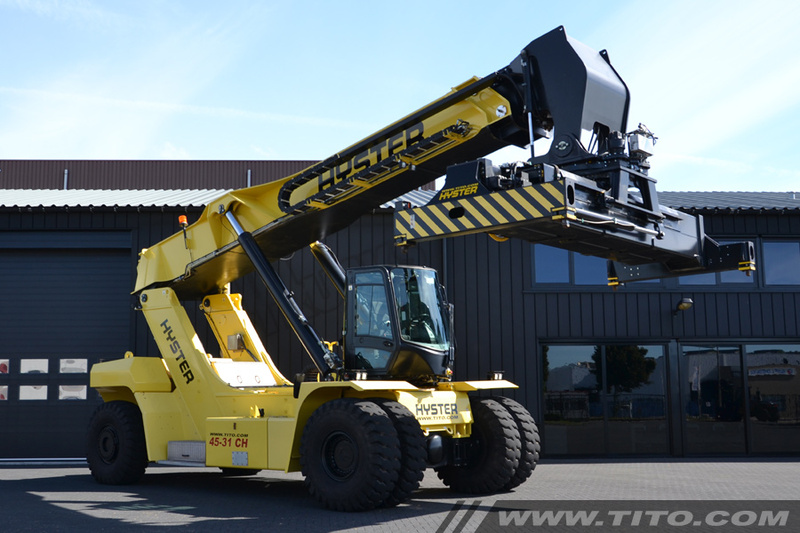 All reach stackers are capable of handling both 8’6”and 9’6” ISO containers. 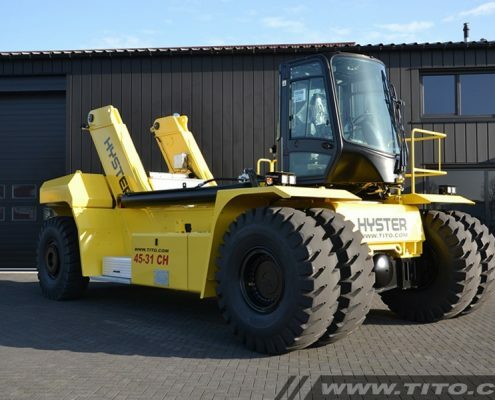 The container handling series can stack up to 5-high in the first row (6-high is available as an option). 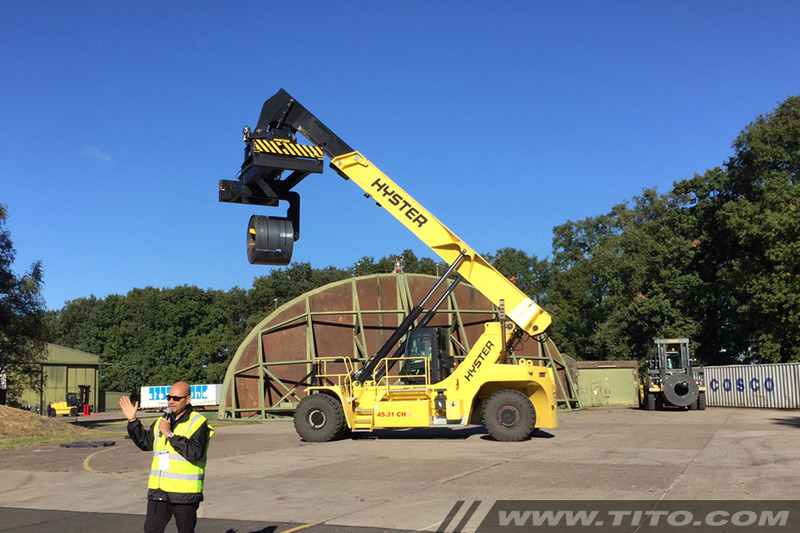 Hyster reach stackers are known for their fast handling speeds – saving valuable loading and offloading time – and are easy to operate. 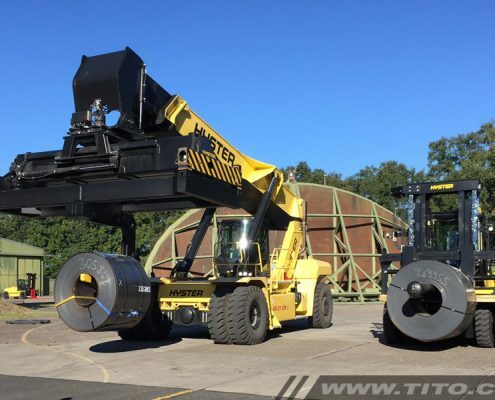 The container handling spreader is a Hyster CH-type telescopic container spreader for handling 20’-45’ ISO containers, featuring a rotator with two hydraulic oil-immersed brakes and one hydraulic motor. The optional Powered Damping Cylinders are capable of tilting the spreader forwards and backwards over 5 degrees, with limited power. This makes it easier to position the spreader onto containers located on sideways sloping trailers (as opposed to the usual front to back sloping trailers). The intermodal handling spreader features Powered Pile Slope, hydraulically powered sideways tilting to enable positioning the spreader onto sloping swap-bodies and trailers. 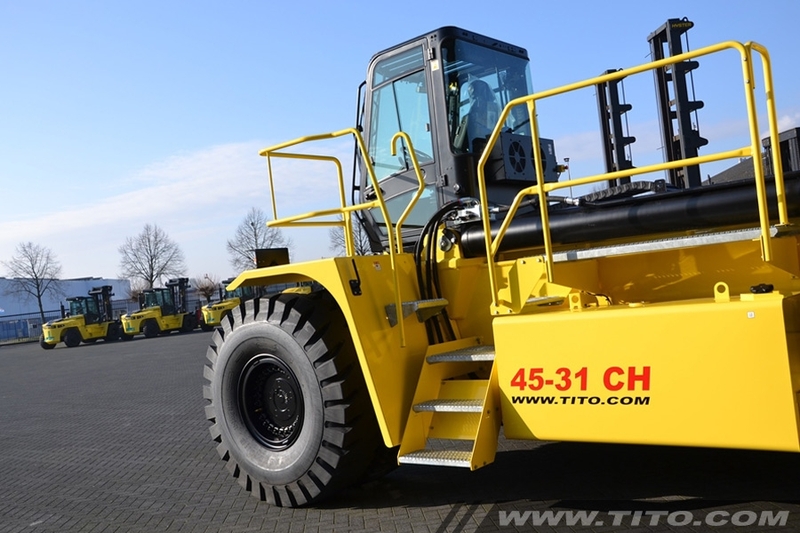 In addition, it has four integrally mounted ‘bottom-lift’ legs to handle swap-bodies/trailers (European types with bottom-lift points according to ISO 1496/1). 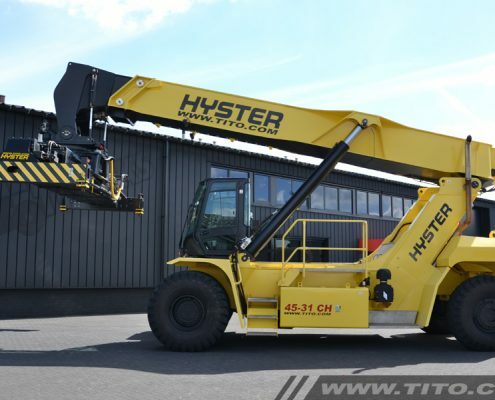 When handling containers, all four legs can be hydraulically rotated (swiveled) upwards and folded away. The standard ‘block-stacking’ feature allows the bottom-lift legs to fold-up within the contours of a 2.44 m wide ISO container. These four legs are also called a piggyback. For more information and many more features, please contact us. Take a look at our stocklist on this website and let us know which new or used reachstacker you need! Call us on +31 24 378 11 11 or send your email to info@tito.com.